Lexengine: Accession of Crimea and trail of sanctions. March 6: Supreme Council of Crimea (the parliament of Crimea) moved proposal for referendum for 16th March,with inclusion of new question: whether Crimea should join Russia or remain in the Ukraine and restore the 1992 Constitution. March 11: The parliament of the Autonomous Republic of Crimea and Sevastopol City Council adopted an independence declaration from Ukraine which was necessary for holding a March 16 referendum. It said: “We, the members of the parliament of the Autonomous Republic of Crimea and the Sevastopol City Council, with regard to the charter of the United Nations and a whole range of other international documents and taking into consideration the confirmation of the status of Kosovo by the United Nations International Court of Justice on July, 22, 2010, which says that unilateral declaration of independence by a part of the country doesn’t violate any international norms, make this decision". March 15: Protests in Moscow ahead of the vote have both supporters and opposition to the intervention in Ukraine and possible incorporation of Crimea. A U.S.-sponsored resolution declaring Crimean referendum, 2014 on the future of Crimean Peninsula, as illegal, was put forward to vote in the UN Security Council to reaffirm council's commitment to Ukraine's "sovereignty, independence, unity and territorial integrity” was vetoed by Russia, while Russia's close ally China abstained, while Russia vetoed the U.N. resolution. 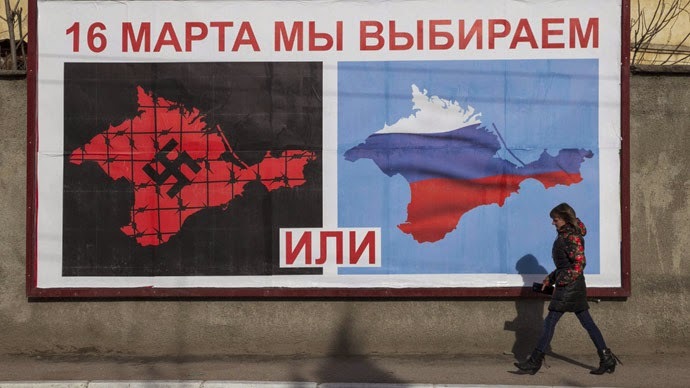 March 16: (The Referendum Day) The referendum on the status of Crimea concluded, with 95% of votes cast for unification with Russia of the more than half that had been counted. March 17: Dispute over the results of the referendum on the status of Crimea was to be questioned from outside organisations.Russia's Deputy Prime Minister Dmitry Rogozin in Dmitry Medvedev's Cabinet gives signs of Crimea’s accession to Russia. Crimea’s Parliament declares independence and asks the Russian Federation to admit the Republic of Crimea into Russia. Crimea's Parliament declares the Russian ruble an official currency, alongside hryvnia. President of Russia Vladimir Putin issues a decree formally recognizing Crimea as an independent state. President of Russia approves draft Treaty between Russian Federation and Republic of Crimea on admission of the Republic of Crimea into the Russian Federation and establishment of the new subjects of the Russian Federation. The Republic of Crimea is recognized by Russia. March 18: (Proposal of admission to RF) According to Article 6 of the Federal Constitutional Law (Russia) "On the Procedure of Admission to the Russian Federation and the Formation Within It New Subject of the Russian Federation" of 2001, President Vladimir Putin notified the Government, the State Duma and the Federation Council of proposals by the Crimean State Council and the Sevastopol Legislative Assembly regarding their admission to the Russian Federation (RF) and the formation of new constituent territories. President of Russia Vladimir Putin addressed the Russian Federal Assembly on Crimea's accession to Russia, and signed the treaty on the admission of the Republic of Crimea (including Sevastopol) into Russia (as the Republic of Crimea and federal city Sevastopol respectively in accordance with the provisions of the 2001 Admission Law). Transnistria sent a request to join the Russian Federation following the Crimean example and in compliance with the Admission Law provisions. March 19: Putin submitted to the State Duma, the lower house of parliament, a treaty of Crimea’s reunification with Russia and a constitutional amendment on setting up two new constituent territories of the Russian Federation. Russia’s Constitutional Court unanimously ruled that the Treaty on the Adoption of the Republic of Crimea to Russia comports with the Russian Constitution. The court sat in an emergency session following a formal request by President Vladimir Putin to assess the constitutionality of the treaty. March 20: (Final admission into RF)The State Duma, the lower house of the Russian parliament ratified the interstate treaty on the admission of Crimea into Russia by a 443-1 vote with no abstentions, backdating the admission to March 18, and approved draft federal constitutional law on admission of the Republic of Crimea and establishment of the new federal subjects of the Russian Federation. A Just Russia's Ilya Ponomarev was the only State Duma member to vote against it. March 21: The Federation Council, the upper house of the Russian parliament unanimously ratified the interstate treaty on the admission of Crimea into Russia. Of its 170 members, 155 members who were present at the session hall voted for ratification of the document. Ukraine signs E.U. trade pact while Russia finalizes Crimea dealings. With both houses of the Federal Assembly having done their ratification, the President of Russia, Vladimir Putin, signed the federal law on ratification of the interstate treaty on the admission of Crimea into Russia and the federal constitutional law "On admission of the Republic of Crimea into the Russian Federation and establishment of the new subjects in the Russian Federation — Republic of Crimea and city of federal importance Sevastopol" in accordance with the provisions of the 2001 Admission Law, therefore amending article 65 of the Constitution of Russia (which lists federal subjects of Russia) in the process). March 23: Belarus recognized Crimea as de-facto part of Russia. March 24: (Withdrawal of Troops by Ukraine) Ukraine orders withdrawal of all Ukrainian armed forces from Crimean peninsula. The Ministry of Defense announced 50% of the Ukrainian troops in Crimea have defected to the Russian military. March 27: (UN Declaration on referendum) Nicaragua recognized incorporation of Crimea into Russia but United Nations General Assembly declared the referendum invalid and reaffirmed Ukraine’s territorial integrity. March 29: Crimea and Sevastopol switched to Moscow Time at 22:00 (10:00 PM) Eastern European Time. On May 9, 2014 new "anti-extremist" amendment to the Criminal Code of Russia, passed in December 2013, comes into force. New article 280.1 lays down that inciting violation of territorial integrity of the Russian Federation (incl. calls for secession of Crimea from the Russia) will be a criminal offence in Russia, punishable by a fine of 300 thousand roubles or imprisonment up to 3 years. If such statements are made in public media or the internet, the punishment could be obligatory works up to 480 hours or imprisonment up to five years. The move of Russia evoked reactions from EU and USA. The United States and the EU have imposed two rounds of visa bans and asset freezes on Russian officials, lawmakers and other allies of President Vladimir Putin to punish Moscow for what Western states say is the illegal seizure of Crimea. Last month, the EU published a list of sanctions against 21 Russian and Ukrainian officials. The list includes the acting prime minister of Crimea, the speaker of Crimea's parliament, three senior Russian commanders and several senior Russian parliamentary officials. The U.S. and its allies also decided to exclude Russia from the G8 and boycott a planned summit in Sochi in June in retaliation over its Crimea takeover. India as part of the BRICS countries has declared in a joint statement that it does not believe sanctions and counter-sanctions to be the appropriate response to the Crimean issue and that a political dialogue is the best answer. Additionally, India announced it will refrain from supporting any ‘unilateral sanctions’ by one country or group of countries unless authorized by the UN. It’s an extremely tricky diplomatic line that India is walking on right now. Unlike Russia, India, along with China and Brazil, has strong political and economic ties with the West especially the US. Therefore any conspicuous stand for Russia will upset its ties with the West which it has been nurturing for years. On the other hand, Russia has been an old ally which has stood by India through many testing moments, thus giving rise to a kind of moral dilemma of not standing by an old friend. So while India is not very visibly siding with anyone party (and very rationally so), any action towards Russia which stands against the principle of the Indian Union – like arbitrarily imposed sanctions as opposed to holding diplomatic dialogue, has been vocally opposed. Although Russia hasn’t received a majority vote in the UN general assembly meeting, India’s stance against the Western sanction and staying away from the voting process has indeed strengthened the Russian case to a great extent. Along with China and Brazil, India is a major BRICS nation enjoying strong economic and political ties with the West. While India is indeed dependent on the West especially in terms of trade, the West too has some key business and commercial interests on the subcontinent. So any diplomatic position that India takes cannot go unnoticed in today’s international political dynamics, and this will certainly work well for Russia. Overall, it is in India’s interest that the current crisis over Crimea settles down sooner, because it will adversely impact the country’s economy if the tension escalates. There are possibilities of international oil and gas prices going up if normalcy doesn’t return to Ukraine. This will pressurize and weaken the rupee. The FDI inflow into India may also be affected adversely. Additionally, while on the face of it India-Ukraine bilateral trade is minuscule, (only $3.1 billion) compared to trade with the United States ($100 billion), China ($65 billion) or even the United Arab Emirates ($75 billion), both the countries have already signed a number of treaties and any diplomatic standoff will certainly impact India’s investment of time and effort in building a fruitful relationship with Ukraine. India has clearly stated that Russia plays an important role in international issues relating to Afghanistan, Syria and Iran. India was with Brazil, China and South Africa in opposing any restrictionson the participation of Russian President Vladimir Putin at the G-20 Summit in Australia in the wake of the Crimean issue. India refrained from taking any stance even in 2008 during Russia-Georgia military conflict and India’s silence worked for Russia at that time. Experts believe a ‘similar policy’ from India would definitely go down well with Moscow. India’s position so far, in the current political and diplomatic flashpoint in Crimea, has been lauded by Russian President Vladimir Putin, signaling continuation of the promising Indo-Russian bonhomie. According to some sources, India needs to stand by Russia at this moment when Moscow keenly looks for international support over the Crimea/Ukraine crisis. The Crimean accession to Russia has uncanny similarities with Sikkim’s merger with India in 1975. That was the time when India and the Soviet Union were extremely thick, having signed a landmark treaty of friendship in 1971 which proved to be instrumental in India winning the war with Pakistan against heavy diplomatic odds given the belligerent opposition from the United States. Sikkim merged with India and became 22nd state of the Indian Union on 16 May, 1975 soon after 97.5 percent Sikkimese voted in a referendum favouring its merger with India. Friendly Russia acquiesced while China was upset. China, after all, was in no mood to repeat India’s folly of accepting Chinese sovereignty over Tibet a quarter century earlier. Incidentally, Tibet is one of the compelling strategic and diplomatic reasons for China to have extended the kind of solid support to Russia over Crimea it has. However, Putin has already lauded the efforts of China and India in the current political and diplomatic flashpoint in Crimea.This gives promising signals for a Russia-India-China bonhomie and a new world order. The draft resolution, which was titled 'Territorial integrity of Ukraine' was co-sponsored by Canada, Costa Rica, Germany, Lithuania, Poland, Ukraine and the US. It affirmed council's commitment to the "sovereignty, political independence, unity and territorial integrity of Ukraine within its internationally recognised borders." The resolution tried to underscored that the March 16 referendum held in Crimea and the city of Sevastopol has no validity and cannot form the basis for any alteration of the status of the Autonomous Republic of Crimea or of the city of Sevastopol.